Periodontal disease is a leading cause of tooth loss. Also known as gum disease, periodontal disease is the chronic inflammation of the gums or the soft tissues surrounding the affected tooth. It can range from mild to serious periodontal disease. The mild form of periodontal disease is called gingivitis, which is the inflammation of gums. Thi is characterized by red, swollen, and bleeding gums and reversible with the practice of good oral hygiene. However, if left untreated gingivitis can lead to periodontitis – a more serious form of periodontal disease. Periodontitis is the condition where the soft tissue surrounding each tooth is inflamed. It is characterized by the presence of bad breath, dental pocket formation, and receding gums. If left untreated, this could lead to tooth loss. Periodontal disease is caused by the presence of bacteria in your mouth that when combined with high sugar food debris, could result to formation of dental plaques. When the plaque accumulates and hardens into tartar, it could irritate and inflame the gums or the surrounding tissues of the teeth. The inflammation could lead to infection. The bacteria will then descend on the tooth’s gum pocket where plaque could form and eventually harden. 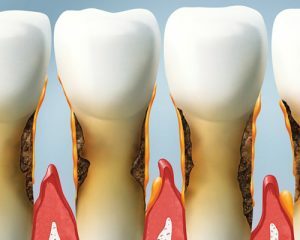 When it calcifies, it would be harder to remove thus allowing the progression of the infection to the connective tissues of the tooth. If you want to avoid the need for a dental bridge or a dental treatment that replaces lost teeth, you will have to treat gum disease on the stage when it is still treatable. Your dentist will need to address gum disease conditions when they are still on the early onset, so that success could be guaranteed. If you notice any of the above warning signs of periodontal infection, please contact our office and ask for a periodontal evaluation.